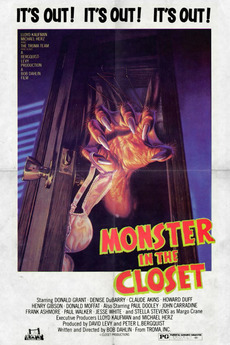 Monster in the Closet is a guilty pleasure, served just the way I like it! You'll either love or hate this movie. I definitely fall in the LOVE category. The first thing it has going for it is the screenplay which contains some cheesy 1950's B-movie dialogue along with a tongue-in-cheek gay subtext that not every viewer will catch. It's intentionally campy and subversive at the same time. Plus the writer plants a prop and a sight gag earlier in the film that play an important role in the movie's climax. I won't ruin the surprise for you because I'm that kind of guy. Then there's also the magnificent parody of the Psycho shower scene that is perfectly executed. I could watch that scene again and again. Kudos to screenplay writer Bob Dahlin for not dumbing down the comedic elements. He also directed this film but I'm surprised he doesn't have many writing credits attached to his name. The second thing Monster in the Closet has going for it is the wonderful cast who are more than capable of selling what Dahlin has written. There are familiar faces such as a hilarious cameo by horror legend John Carradine, Claude Akins [B.J. and the Bear], Howard Duff [Knott's Landing], Henry Gibson [Laugh In] and Donald Moffat [The Thing, Dallas]. Most of these may not be familiar names but you will know their faces immediately and each has an extensive body of work as an actor. Monster in the Closet also boasts the screen debut of Paul Walker [Fast & Furious franchise] who is a wee little kid in this film but already shows some serious acting chops. The last thing it has going for it is the monster which is a send up of all the really bad 1950's sci-fi monsters. It's clearly a guy in a rubber suit which works perfectly for this film. There's also a small nod to Alien that you'll catch in the creature's design. I'm sure it was intentional. As a side note, 6' 5" Kevin Peter Hall dons the monster suit. He is monster royalty, having also been the creature in the Predator films as well as Harry and the Hendersons. This is NOT, I repeat, this is NOT a scary film. But if you're a fan of cult classics such as Airplane  and Attack of the Killer Tomatoes , definitely give this one a try.